From left to right: First place winner Angniun Opriann Lomack of Akiachak, second place winner Akagaralria Auna Friday of Chevak, and third place winnter Allirkaar Richelle Phillip of Akiachak. KYUK reports from Anchorage on the toughest spell-off in the eight year history of the event. “Assirtuq,” declared a judge. That’s Yup’ik for "correct." “Spellers take a break for five minutes,” announced Dan, while she and the judges conferred. They needed time to choose more words for the next battle, which narrowed the field down to three, and then the final two, each of whom spoke a different dialect. Allirkaar Richelle Phillip speaks a central Yup’ik dialect spoken in Akiachak, and Akagarallaria Auna Friday speaks the Cu'pik spoken in the coastal village of Chevak. “E-P-U-L-E-K, epulek,” she said, and heard the prayed for “assirtuq” from the judge. 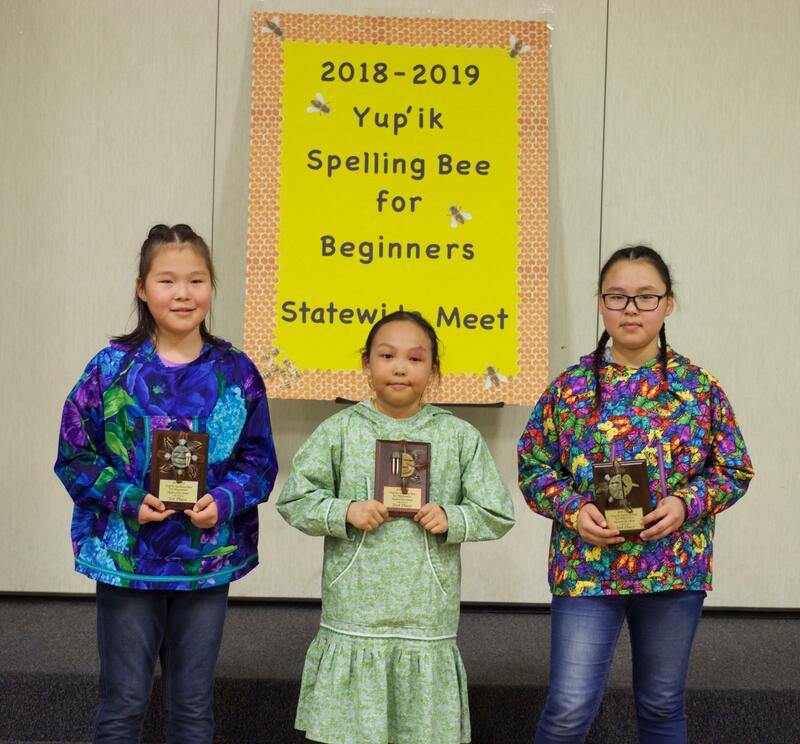 To earn her second place on the podium, Friday had to out-spell Richelle Phillip, the teasing cousin of the winner of this year’s Yup’ik Spelling Bee. Both cousins are sixth graders at Akiachak School. The winner, Angniun Opriann Lomack, worried about one competitor more than any other. “I thought my cousin Richelle was going to beat me,” said Lomack.